In 2014, Karen and Mike Mazzaroli sent their foster boy, 10 year old Draper, to us. 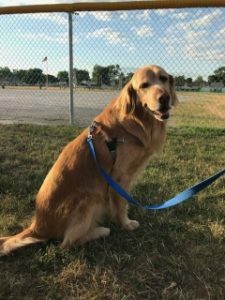 He settled right in, went on waterfall road trips, romped in the snow, barked at duck butts, and turned his new found talents into being a therapy dog visiting schools, nursing centers (with a marked preference for senior ladies) and the Detroit VA hospital. Rowdy and fun, he was always game to go. Alas, cancer stole him from us in December of 2017. After many months of tears and healing, we reached back out to Kristin Vesely and Karen Mazzaroli about bringing a new senior home. For us, this would be the 6th senior adoption, and we’ve adored each and every one of our double digit age dogs, Zander, Dreyfus, Bazil, Brando, and Draper. Thankfully, Mike Flynn had been fostering Ginger, a charmer from Puerto Rico, and Mike got him through his anxiety from a very rough journey to the chilly north and diet needs with the help of his two seniors, Snickers and Dawn. After an island meet up in Paw Paw, MI, Mike handed over the leash and Ginger curled up and snoozed his way home. Within days, Ginger, now called Rico, settled into his new beds, claimed his yard and our hearts. He’s a prince on walks, heads out to watch softball games, enjoys doggie ice cream cones, has been fishing, wading and has toured the local Tractor Supply. Rico entertained at the monthly ladies’ wine group and they came with new toys and games and lots of attention. The nice neighbor lady made him his very own quilt in the colors of his birthplace and it’s lovely to snooze in the shade with his cadre of admirers. Now that he’s walked right in and sat right down, we are looking forward to many more adventures with our island boy. We are so thankful to Mike Flynn, Kristin Vesley and the Mazzaroli family for all the support over the years. While not close by, we feel like cherished family of AGaG. 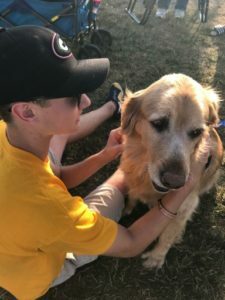 Adopting seniors is absolutely the best fit for our family – puppies are cute but seniors rock!